PITTSBURGH—Amelia Nichols, a junior in Carnegie Mellon University's College of Humanities and Social Sciences, has been named a 2009 Harry S. Truman Scholarship recipient. Sixty Truman Scholars are selected nationwide each year based on leadership potential, intellectual ability and their "likelihood of making a difference." "Receiving the Truman Scholarship is an amazing honor," said Nichols, Carnegie Mellon's fifth Truman Scholar. "I had such a great, formative experience applying for this award." The scholarship, established by Congress in 1977, provides up to $30,000 for graduate study leading to a career in government or public service. Recipients also receive priority in the admission process and supplemental financial aid at some premier graduate institutions. In addition, they receive leadership training, career and graduate school counseling, and special internship opportunities within the federal government. Nichols, a double major in psychology and urban history/education policy, plans to pursue graduate studies in social work and public policy. "Amelia has the intellectual acumen, interpersonal savvy, inner strength and passionate drive to embark on a career that will positively impact young children and their families by improving research and policy," said Nichols' faculty adviser Sharon Carver, director of Carnegie Mellon's Children's School. Stephanie Wallach, assistant vice provost for undergraduate education, works closely with students like Nichols through the university's Fellowships and Scholarships Office. "One of the unique aspects of the Truman application is the policy statement," Wallach said. "It helps the selection committee to get to know the student both personally and professionally." Nichols' policy statement advocated for increased federal funding for home visitation programs designed to prevent child mistreatment. This statement was an extension of a home visitation research project she completed in Carver's graduate-level "Educational Goals, Instruction and Assessment" class. "I was drawn to it," she said, "because it was an opportunity to connect policy with my academic interests and involvement in the community." Nichols also has applied her studies as a classroom assistant at Carnegie Mellon's Children's School and as a research assistant at the University of Pittsburgh's Learning Research and Development Center. Her political experience includes an internship in the Oakland office of Barack Obama's Campaign for Change as well as leadership roles with Students for Barack Obama at Carnegie Mellon. Last summer, Nichols interned at the Washington, D.C., office of U.S. Sen. Christopher Dodd (D-Conn.), where she provided research assistance to the Subcommittee on Children and Families. Over the past three years, Nichols has contributed to the growth of Carnegie Mellon's Strong Women, Strong Girls chapter. This group-based mentoring program enhances the lives of at-risk girls through the study of contemporary women role models, mentoring relationships between college-aged women and girls in grades 3-5, and activities focused on skill-building. As this year's chapter director, she works with 25 mentors and 75 young girls across five Pittsburgh-area sites. Nichols has served as the vice president of social standards for the Delta Gamma Sorority, selections chair for Lambda Sigma Honor Society and a teaching assistant. In addition, she is involved with the university's Women's Leadership Program and gender organizations. More information on the Truman Scholarship is available at http://www.truman.gov/. 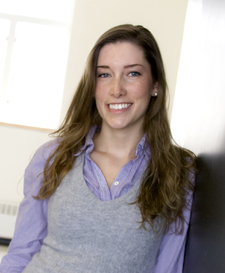 Pictured above is Amelia Nichols, a 2009 Harry S. Truman Scholarship recipient.